In the wave of expansion of the CART series, Ron Dickson, president of D3 Motorsport Development and holder of CART rights during the 80's, establish a GP circuit on Queensland, after a brief meeting between the State Premier and the prominet businessmen on the area. With preliminary work done from 1988, the circuit was first used in 1991 as CART's season opener. 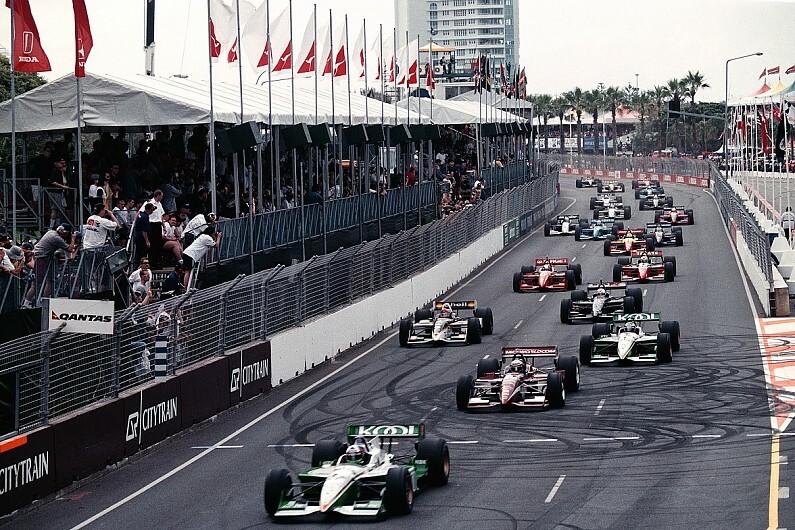 The ChampCar / IRL fusion condemn this iconical circuit of Australia to other series (Touring Car and A1 Grand Prix), stealing its charm and exciting races from the Indycar calendar. I went to, I think, the first three years. In 84 (or 85?) I had a pass that allowed me everywhere except the pits when they were hot. So I spent much of practice on the photographer's tower at turn 2. I looked so out of place with the professional photographers (even though I had a fancy camera and bag), I was "carded" several times! Another year (probably 86), the pace car was a Ford Thunderbird, and they had every Ford dealer in the area supply a replica pace car for a parade lap. (Yes, you could buy a Meadowlands Grand Prix replica pace car, all doo-dadded up, at your local Ford dealer.) I think there were over 50 of them. I got to drive one for the parade lap. Funny thing is that as we were going home, exiting the Turnpike at exit 15W, the car lost power and stopped. A little bit of investigation showed that the fuel line had popped off from a connector under the car. It would have been really embarrassing to Ford if my replica pace car crapped out on the track! One other interesting thing about the Meadowlands race is that the paddock was on the floor of the Meadowlands hockey arena. It was strange seeing cars there. It was air conditioned, so I guess that was a plus for the crews. Last edited by Bobcat00; 03-16-2019, 06:22 PM. 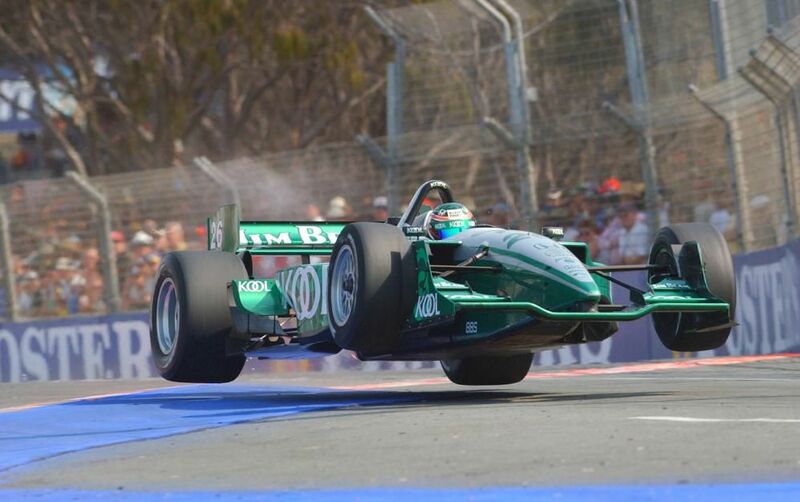 If I have to visit three US street circuit, Long Beach would be one of my choice. ¿It is so crowded on GP's as you said? Very interesting stories here!! Do you still have the photos?? 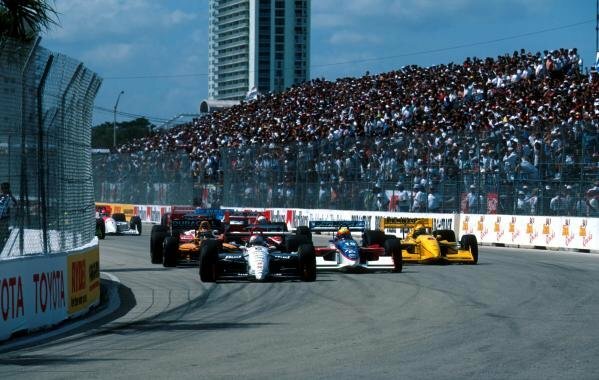 If you remember, Miami hosted a Grand Prix race during the 80's at Tamiami Park, that floudered after 1988. But Ralph Sánchez never give up on its idea to attract the best possible motor racing series to the city. IMSA and Trans-Am was promoted with very successful results, and while Homestead was in construction, Sánchez arranged a substitute race on the Bicentennial Park Circuit for CART for 1995. The Bicentennial Park was a semi-permanet circuit, with purpose-built roads in the park area which conects to Biscayne Boulevard near the entrance of the Port of Miami. The race was run opposite (clockwise) to the previous races held here (anti-clockwise), as to prevent an advantage to drivers with IMSA race experience (according to sources). Other sources indicates that was to prevent a first turn accident. An added chicane on the long backstrecht, two widened turns and the usual layout of the IMSA circuit, completed the design. As 1995 season's opener, the Bicentennial Park gave a good result for public and teams. Jacques Villeneuve its the only CART winner here, as in 1996 the race was held on the Homestead oval. ...but at the, Villeneuve was 1st, and Michael was out with a wreck car. The Bicentennial Park track is now almost completely gone. The vestiges of the circuit survived for a few years after its last race, but ultimately a big chunk of it was wiped out when they built the new arena for the Miami Heat. The rest of it was torn up in the 2010s and redeveloped...they built the new art museum and science museum. So other than Biscayne Blvd. itself, nothing is left. The concept of the track was somewhat interesting. It was a temporary course, but one might consider it a "semi-permanent" track. Except for the run down Biscayne Blvd., the rest of the course was on roads that weren't really city streets. I don't even recall if those roads were driven on by cars during the rest of the year. That area just sat there as an open grass field along the waterway. It must have been convenient when they were preparing the course for race week. They could set up the most of the walls/catchfences, grandstands, and support area without interrupting normal daily traffic. Only the part up Biscayne actually interfered with city traffic, and they could finish that part right at the very end. The other nice part of that track...as one can notice in the photos...since most of the track was "semi-permanent", they set it up in such a way that there was grass on both sides of the racecourse, and the concrete walls were pretty well offset from the edge of the racing surface. It more resembled a permanent road course in that aspect, at least for that part of the circuit. A lot different than say, the Meadowlands or downtown Detroit. Has IndyCar or its predecessors ever raced at the Montreal Ile Notre-Dame F1 course? Last time I was there, it was for Warped Tour. 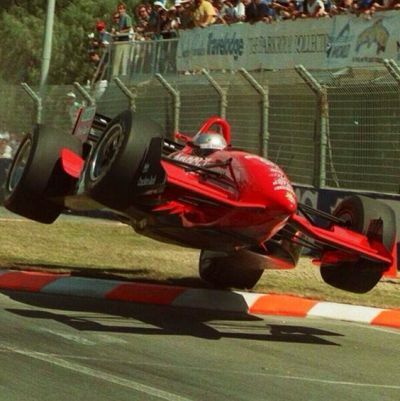 They raced there from 2002-2006 under CART/Champcar sanction. Another note about Miami (Bicentennial Park). That race in 1995 was held while Homestead Motorsport Complex (it's name at the time) was still under construction. Ralph Sanchez was the promoter of both Bicentennial Park and Homestead (and Tamiami Park for that matter), and spearheaded CART returning to the Miami area. It was thought that the visit to Bicentennial Park was simply a one-year temporary deal as they waited out Homestead to be completed. But actually reading articles of the day, CART had an initial 3-year contract to run the street course (1995-1997). Homestead was technically not yet on the table. However, it did not take long for the contract to be transferred to Homestead in time for the 1996 event.